Natalia Vico is an illustrator who was born in Madrid and is now based in Switzerland. Her creative journey as a freelance illustrator began when she studied design and advertising, moving on to working as an Art Director for some agencies. Alongside illustrating, Vico has started getting into embroidery as another medium for creative expression. 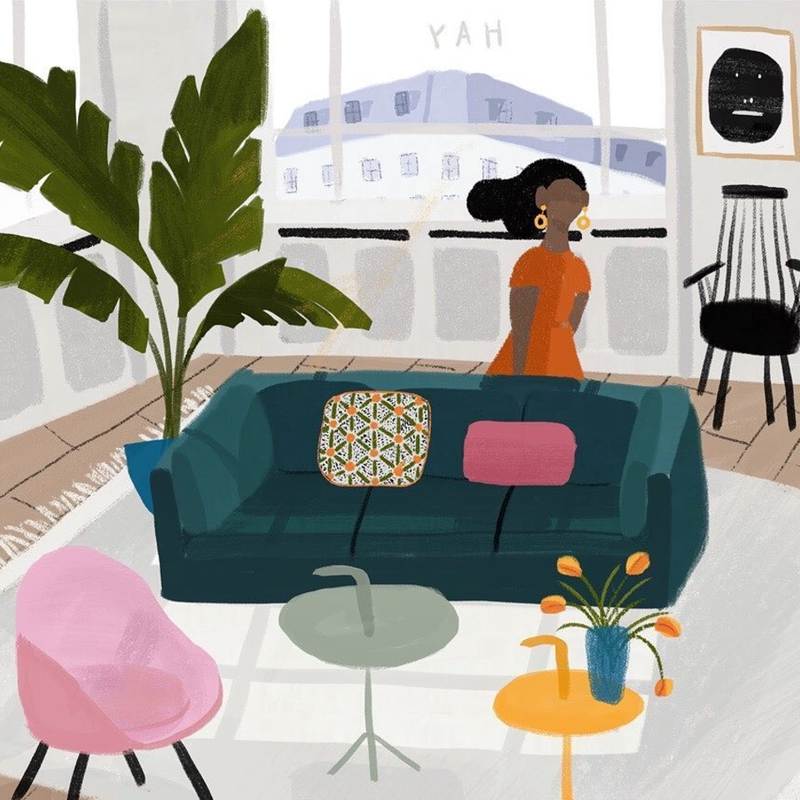 We got to know a little bit more about Vico as we spoke with the illustrator about her creative journey so far and also about some current exciting projects that she has been working on. "I was born in Madrid, where I grew up in a small neighbourhood close to the airport called Barajas. I studied design and advertising and I began to work as an Art Director in some agencies. Two years ago I decided to move to Switzerland where I actually work as a freelancer. It is here that I have begun to be more into illustration." Vico first began studying Business Administration at college but started to feel like she wanted to do something more creative after two years of the course. She then began studying graphic design and advertising at the same time. "Women of my family have always been very creative, my grandmother used to sew and embroider lovely things and I remember my mother always painting with oils when I was a child, so I was always painting as well." "Having plants at home or at work is very important for me. I think they give me good energy and inspire me in a way. I think that we don´t have enough plants and trees in our cities and it´s a pity." "Madrid is my hometown, I have been living there all these years before moving to Switzerland two years ago. Through my life, I have been travelling a lot but I never had the need of living abroad. But now I think that it is a super good experience to learn more about yourself and about what you really wanna do." Growing up in Madrid and moving to Switzerland, Vico has been lucky to experience the best of both creative worlds. "I believe they are quite different, both culturally and artistically speaking, Vico says. "I think that Swiss style is much more methodical and pure. The streets are full of good swiss poster designs, for example. In Spain however, there are many more things going on, even in the small cities." Through looking at Vico's work, it is obvious that the illustrator is hugely inspired by plants. "Having plants at home or at work is very important for me. I think they give me good energy and inspire me in a way. I think that we don´t have enough plants and trees in our cities and it´s a pity. So I guess that all the references of interiors that I have in my mind include some plants as an essential element of the space." Vico has also been working on an embroidery project that also seems to have a heavy influence of plants. "For me, embroidering is like painting with thread, it´s like another technique of illustration, like gouache or acrylics. This project emerged as a personal need to escape from the laptop and to start manual work. Kind of come back to the roots. So I created Remata! Studio. Remata is a Spanish word that means finish your stitch! It is something that I say to myself very often when I am stitching and I am not able to stop, as it is quite addictive." 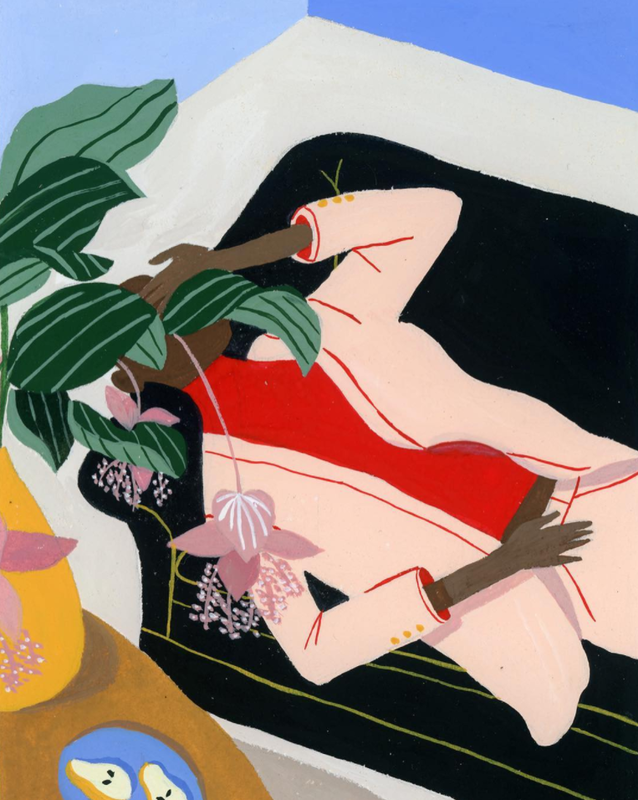 With such a unique and distinctive style of her own, we couldn't help but wonder about some the illustrator's favourite artists who have influenced her work. "I love how Edward Hopper uses colour to create his scenes, the vibrant artworks of Gauguin and I also love everything about Matisse. I was always attracted by set design on films, like Almodovar´s scenographies, and I really appreciate the work of César Manrique. Instagram is now one of my biggest sources to discover incredible artists, like the photos of Pia Riverola and Laura Egea, as well as the crazy and colourful feed of Miranda Makaroff. And I really love the portraits of Carla Fuentes, one of my favourites." With such wonderful list of influences and inspirations, if Vico had the opportunity to collaborate with any artist living or dead, she would work with many of them. "I could dream of collaborating with Tadao Ando, creating a huge mural painting for one of his buildings. I was impressed by his work that I saw two years ago when I visited Japan." Vico already has an incredible body of work and her future as an artist is looking very exciting. 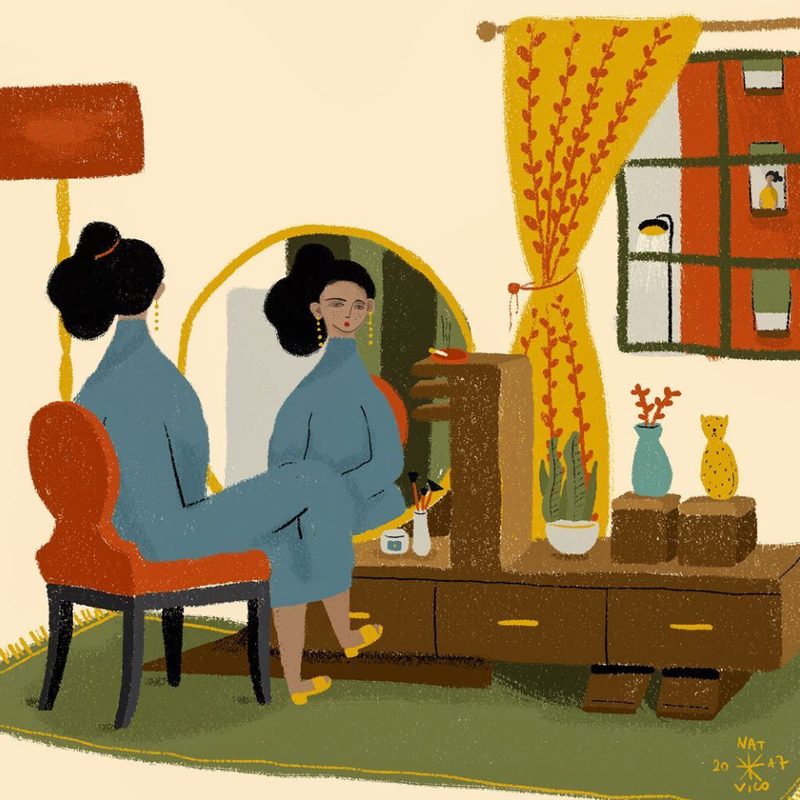 The illustrator also see herself "mixing paint on my palette"in the next few years.